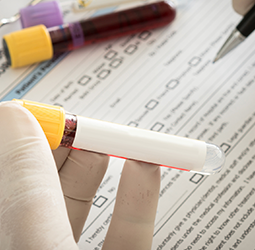 Cool EMS keeps items fresh for prompt delivery overseas. The temperature in the box is kept between 0 and 10 degrees C for the Chilled type and below minus 15 degrees C for the Frozen type. Door-to-door service is provided to meet the customer's needs at low cost. You can check the regulations at each destination by clicking the flag. *Clicking on the given links, it will move out of Japan Post Homepage. Reminder:All the homepage outside of Japan Post is managed by each individuals, not JP Post. sends Japanese “Osechi” to a family member overseas. 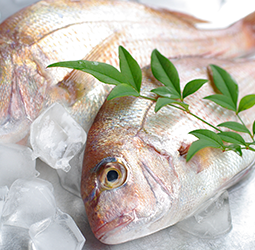 industry sends fresh fish to a restaurant overseas. We use our special cool box and logistics system, so there is no air leakage. A constant temperature is maintained by Cool EMS. 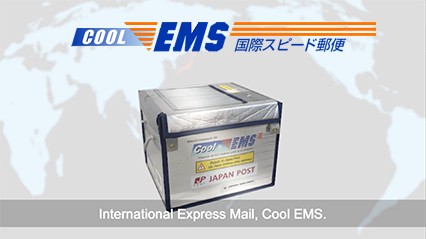 A Cool EMS item is delivered on the second day after mailing at the earliest in Taiwan, Hong Kong, Vietnam, Thailand, Malaysia, Singapore, India and France via EMS, the fastest postal service. You can choose from three box sizes to fit your item. Cool EMS can suppoort your overseas bussiness via door-to-door service at low cost. It introduces the features of Cool EMS, how to send, and the entire process to the delivery in Taiwan. It's difficult to mainain a constant temperature due to air leakage at each operational step. 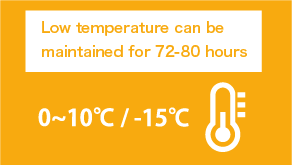 The low temperature will be maintained for 72-80 hours without air leakage! Removed from a cool box and delivered. 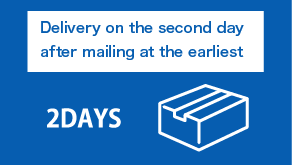 The shipping day is Monday or Tuesday, depending on the post office. The post office staff will contact you by the next day following the application deadline. Please note that if the number of bookings exceeds our regular quota, we may be unable to handle your application. Refregiate your items, pack them, and send. Please prepare one original copy of the "Declaration form for certification of Cool EMS items" for Cool EMS to Hong Kong, Vietnam and Thailand. Cool EMS service solves your shipping problems! Case 1.Sending Japanese “Osechi” to a family member overseas. Mr. A stays overseas for his business. He expects to be overseas on New Year’s Day. 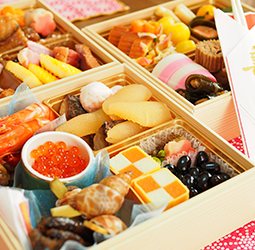 Therefore, his family in Japan sends him frozen Osechi, a traditional New Year’s dish in Japan. The family is glad that they are able to send froze items overseas from a local post office. Mr. A savors with his colleagues the taste of Japan he cannot get overseas. Like Mr. A’s family, both individual customers and corporate customers can send frozen/chilled items without complicated processes such as membership registration. Also, there is no minimum order quantity. This is a popular feature of Cool EMS! A customer sends fish he catches himself to local Japanese restaurants overseas. He says, “Cool EMS is good because I can fill seasonal orders from overseas restaurants all year round, and I can get feedback directly from the customers.” As the popularity of Japanese foods is growing, he plans to increase the volume of shipments. A customer has been personally bringing overseas research samples that need to be kept chilled. She starts using Cool EMS because it does not have a minimum order quantity. As this service enables her to plan the delivery day with the partner organization, she uses Cool EMS on a regular basis! Note: You may need an export license in Japan and an import license at the destination, or other documents depending on the contents. Case 4.Sending items to individual customers overseas. 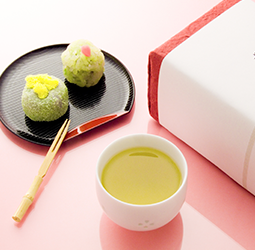 Sweets made in Japan are currently getting popularity overseas. Increasingly, individual customers purchase the items online. Mr. B, an e-commerce seller, starts using Cool EMS to meet customer needs. The delivery staff in overseas will contact an addressee in advance of the delivery, which is convenient for the addressee. Mr. B says that the number of orders from overseas is increasing thanks to positive reviews from customers.